In a couple days times it will be the official countdown for Christmas (if you go by that galaxy advent calendar in my cupboard I've been lusting over for the last week) which means blog mas is just around the corner. I did blogmas last year and to be honest, it wasn't the walk in the park I was expecting. I thought I'd put together a few little tips I'm using this year to organise a more stress-free blogmas. I love a good list, I don't even care how nerdy that sounds at this point. I have put together a little checklist planning the next month's posts, this way I can plan ahead so I'm not stuck with a 'come up with an idea in an hour, write a post and find a photo ready for tomorrow' like last year. November / December = No light. I use natural lighting for all of my photos so I always have to make the most of the daylight. I can use the list above to see what photos I need and have a bulk photography 'sesh' during those 3 whole hours of light we get at this time of year. If you're after for photography tips I have a post here. 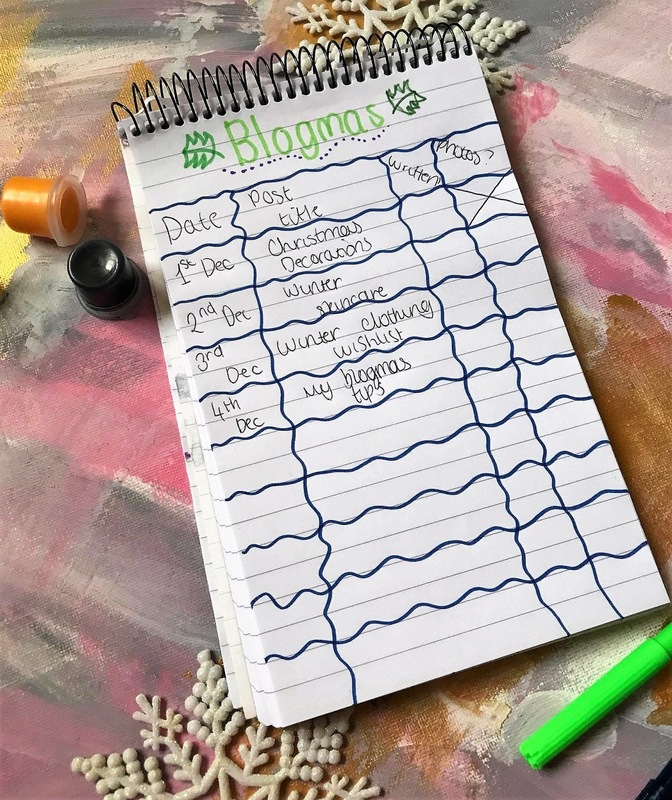 The one thing that held back my blogmas last year was having to speed write a post at 11pm and schedule it for 7am the morning after. This year I'm going to make the most of days off and bulk write a couple of posts in advance. A post a day is a lot to handle for those of us who only post once a week, and that's fine. 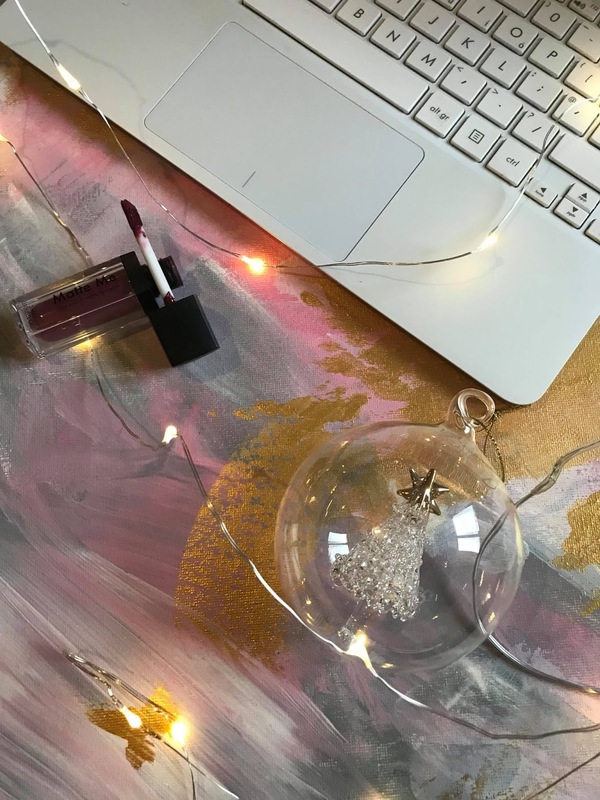 If this puts too much stress on you then it's okay to slow down, you can still put Christmas posts out on your normal days, There's also 12 days of Christmas which is a nice way to ease into blogging if you're not quite ready to do 24 days but want a challenge!. Hope these tips are helpful!. Since being a blogger my photography game has improved sooo much, I have briefly touched on some photography tips in the past, one of the tips I mentioned was photography props. The great thing about photography props is that they can show a bloggers personality so well but it can be a little confusing to know what props to use sometimes so I've put together a little list of budget photography props most of which you most likely already own to completely up your game!. Confetti - simple and effective if you have none to hand simply hole punch a magazine or some coloured card and use that. Technology - Your phone (if you're not using it to take the photos), Headphones, iPads etc. Coloured paper - You can always rely on coloured or patterned paper to give you a great photography background. Washi Tape - Simple and cute, use it to hold prints in place or simply to decorate a plain background. Fairy lights - My faveeee!, fairy lights will instantly perk up any photo guaranteed. Flowers - False or real both look great!. Books - stack your favourite books against a nice bright background for a quick instant stock photo. Makeup - Brushes, lippies, liners anything to dot around your focus. Fabrics - A nice throw, t-shirt or even a denim jacket can make all the difference in your photos. Home decor - I love using candles in my photography, now that we're getting to the festive spirit things like baubles and tinsel work perfectly. Stationary - Cute pens, bookmarks, notepads and prints make great photo props and you most likely already own them so they're the ideal props. Accessories - Anything you have... Watches, necklaces, bracelets, glasses, chokers if you don't have much you can find really cheap jewellery on Ebay for roughly £2. What's your favourite photography prop? If there's one staple in my skincare routine it's cleanser, It's also the most important stage of my skin care. However, as you most likely know by now I have such sensitive skin, my skin is also quite oily in places as well as dry in others (contracting right?). Skintifique got in contact recently and told me about their Cleanser P and honestly, I've gotta tell you alllll about it because it's honestly incredible. First thing I noticed about the cleanser is that it only has 5 ingredients, yeah 5. 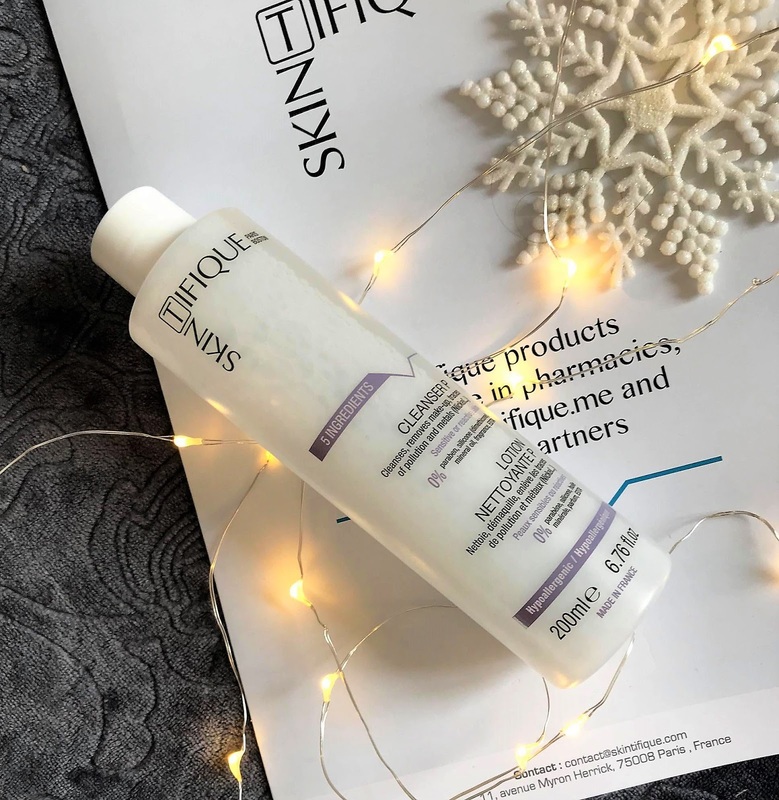 Skintifique uses very few ingredients as radical simplicity, This basically means they believe a formula should contain the least amount of ingredients possible in order to cleanse deep in the skin without any irritation, for my sensitive skin it honestly sounded perfect. The formula is a micellar water, now I usually struggle with these because they leave my skin proper dry. Like they just strip my skin but after trying this one out I'm really quite impressed, it seems to have removed every trace of my make up (literally) without leaving my skin feeling stripped and dry. I had no signs of irritation and my skin also felt less oily, fresher and generally cleaner. I used The cleanser as part of my usual routine. I followed it up with some of the Botanics toning spray and the body shop's vitamin E cream. I noticed that my make up almost melted underneath the cotton pad which was really reassuring as usually if my make up is left on I can break out pretty bad. 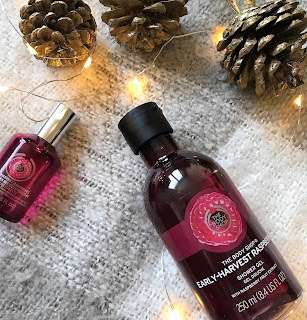 The brand itself has very good morals, the cleanser is vegan, cruelty-free, eco-friendly. The products are hypoallergenic and tolerance tested. Overall I'm really enjoying this cleanser and I'd be happy to repurchase it. Have you tried this cleanser?. We all know I bloody love the body shop, it isn't a secret. I decided I'd pop in a little order after seeing a lil sale on my local reps page, I thought I'd give you a lil' peep at what I picked up and share my first impressions. I already knew I loved this scent since I bought a scrub last year in it, This is such a fruity yet not sickly scent. The EDT lasts well and every now and again you get a nice lil' whiff of it which I like. The shower gel I find really moisturizing, The scent is giving me some serious Autumn feels, I really love this range. An autumn special, which I just had to try. I have mixed feelings about this one, on one hand, I think it smells really warm and comforting but on the other hand, it's very sweet... but I kinda like it. 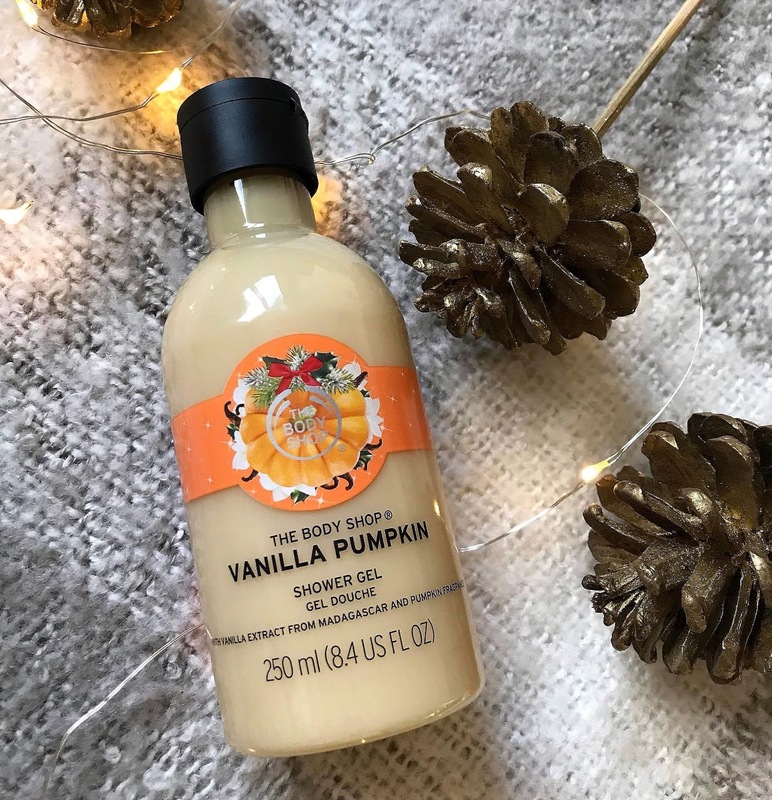 However, if you aren't a fan of like overpowering sweet smells I'd steer clear, The creamy consistency is one of my favorite types from the body shop purely because of how moisturizing they are. 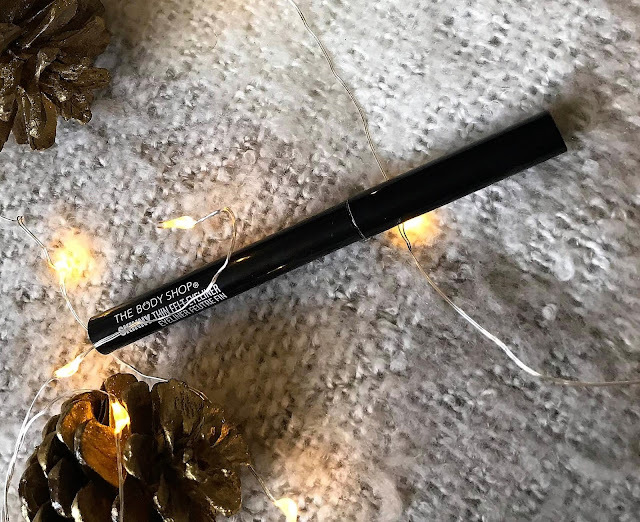 I bought this one because as you may know I've gone cruelty free and I wanted to replace my Maybelinne liner as they test on animals, I saw this one on sale and I snatched it up straight the way, The liner itself is kind of different to anything I've used before as it has a rubber part near the lid for you to grip too which means you have better precision but I'm still getting used to holding the liner because I'm not used to it, Also the nib is a lot smaller than what I'm used to but all in all I like the formula and when I have managed to use it correctly I've been quite impressed with this. 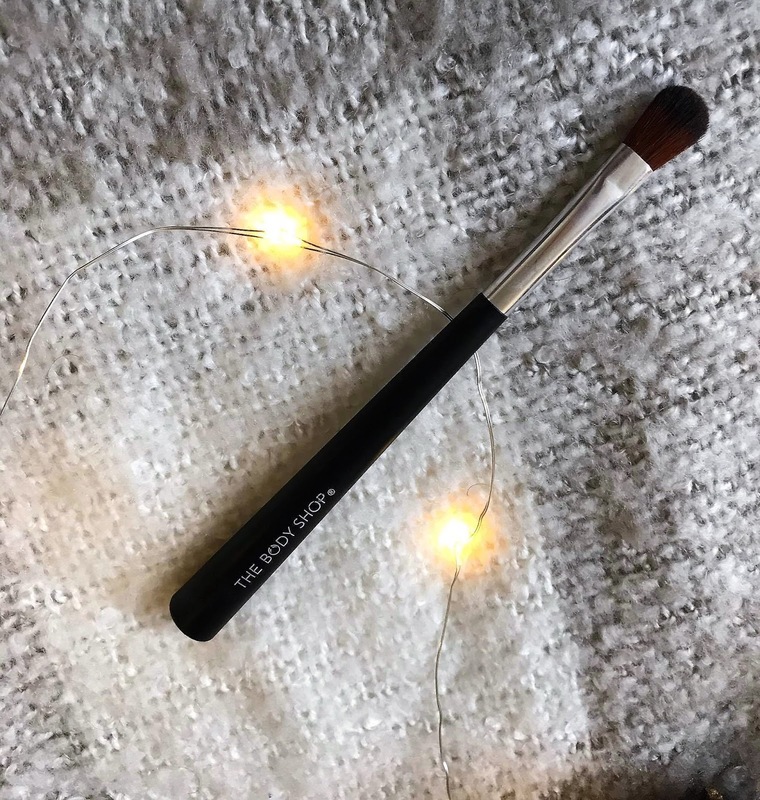 I really needed one of these so when I saw it on offer I just added it to my order straight the way, I really like this one, I was after of more of a dome brush but this one is flatter. I do like this brush though, it blends well and it's really soft and easy to use. I picked up a couple of gifts to save for Christmas so I will not take any photos (Friends, Family, look away now). I went for a Hemp nail tin which comes with a nail file and a hemp hand cream as well as 2 Shea collections, These are wrapped so lovely, I almost don't want to wrap it because the gift boxes are just so gorgeous, I might leave them as they are.